Type ADLR | TROX South Africa (Pty) Ltd.
TROX ceiling diffusers of the ADLR type are intended primarily for installation flush with the ceiling. Installation flush with the ceiling is not absolutely necessary for the exhaust air systems. Typical supply air temperature differentials range between +10 and -10 K.
Round variants (ADLR type) can be deployed as appropriate for the customary ceiling structures. The round spigot on the plenum box can be located on the side or on the top. 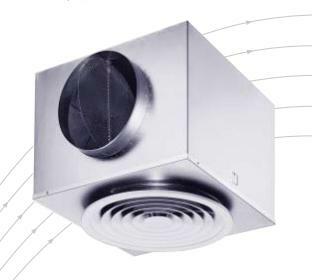 TROX ceiling diffusers ADLR with its radial air discharge ensures a high degree of comfort. This ceiling diffuser is available with round face plate for integration into modular ceilings.